We have our first perceived head-scratcher of the NFL Draft. 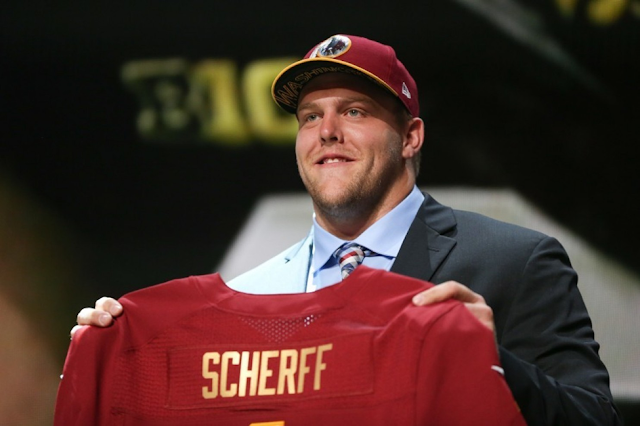 The Washington Redskins selected Iowa guard/tackle Brandon Scherff, a strong but conservative move by new general manager Scot McCloughan. McCloughan oversaw the drafting of star offensive lineman Mike Iupati in San Francisco back in 2010 and could be trying to replicate his formula in the Nation's Capital. Washington has enough to worry about at quarterback, so why not strengthen the line in front of them? The Redskins gave up the second-most sacks in football a year ago and, despite losing some quality pass-rushers like Brian Orakpo in free agency, opted against taking USC's Leonard Williams, believed by some to be the best overall talent in the draft. Washington has held a top five pick eight times in franchise history, using the pick on offensive line help just twice, most recently Trent Williams back in 2010. But this is a new era in D.C. and they hope that a 6-5, 320-pound mauler can get them off on the right foot. If nothing else, all indications are that Washington is getting a Day One starter that, if healthy, can play two positions at an elite level for years to come.